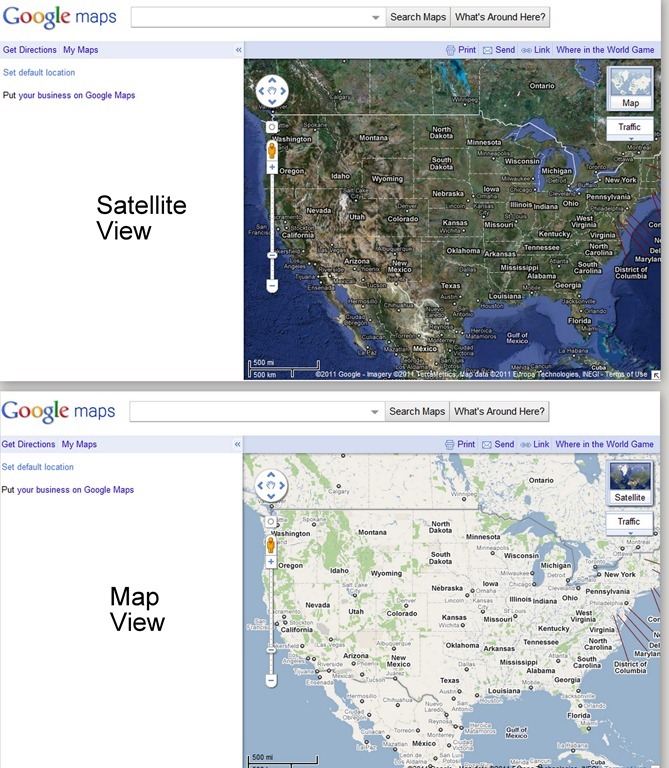 It’s been a while since I’ve focused on Google Maps in this blog, and they’ve made so many improvements. If you’ve never visited Google Maps, you’re in for a treat. It’s completely web-based, ‘in the clouds’ according to the current lingo, so just head on over to www.maps.google.com. What you see depends on whether the little icon in the upper right is set to Map or Satellite. Ooops, I forgot we need to stop in Bowling Green, Kentucky first. 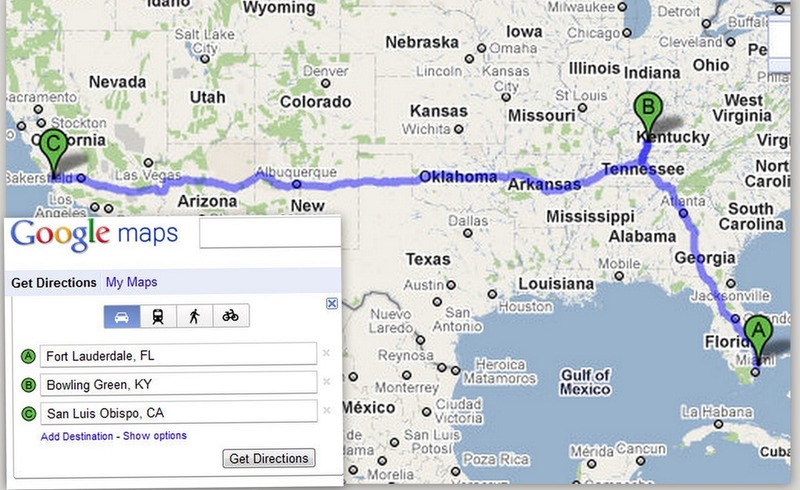 I click ‘Add Destination’ and type Bowling Green, KY into the third box. Then I drag that third box to the second position before clicking on Get Directions again. Once we get to San Luis Obispo, I want to visit one of my favorite places, Hearst Castle. 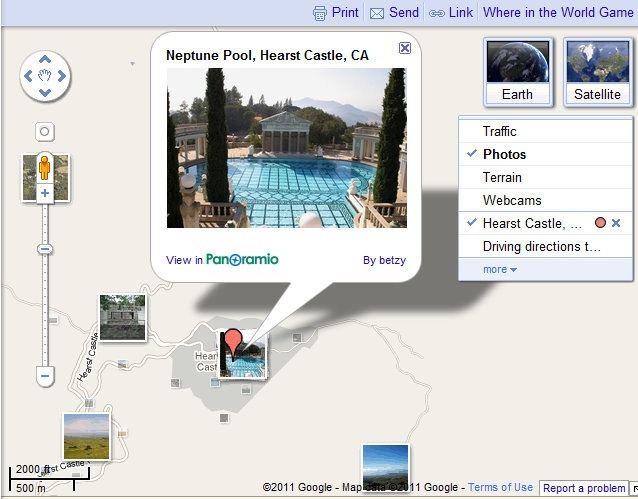 Still using Google Maps, I can zoom in to the area north of San Luis Obispo by double-clicking on it or, better yet, just type Hearst Castle in the Search box, and go straight there. To see photos that other people have taken in the area, just click on the drop-down arrow below Map/Satellite button in the upper right and you see a list of options, including Photos. When you check that, you will see thumbnails for every photo – click on the photo and it will enlarge. Zoom in or out and you’ll see more thumbnails accordingly. Maybe we’ll even stay in a campground near Hearst Castle. 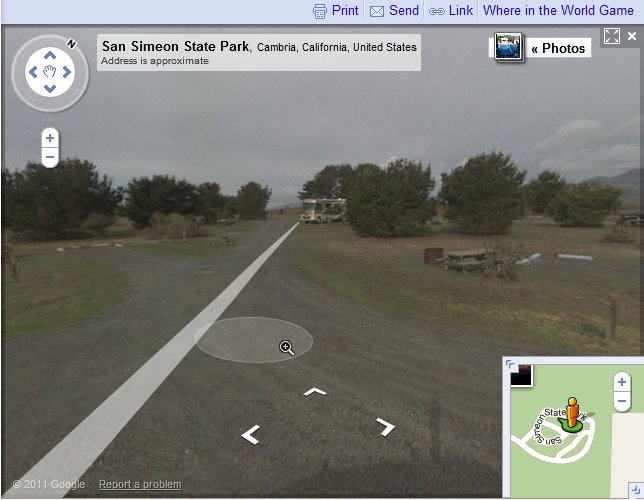 I see San Simeon State Park just south of the castle. Maps are nice, and photos are nice, but I’d really like to see exactly what the campground looks like. That’s what Street View is for. Street View doesn’t exist everywhere, but it’s increasing every day. How do you know if Street View covers the area? You grab that little yellow guy on the navigation bar and drag him over the area where you want to look. If the road turns blue, Street View is there. Now just drop off the little guy, and enter the virtual world of your destination. You now have controls to drive around the park – clicking on the white arrows, or using the navigation tool in the upper left. When you’re done with Street View, click the X in the upper right. One of the things that Google has changed throughout it’s product line is the menu in the upper right. It used to show your Google account email address, a Settings menu, and a Help menu. Now it just shows your name (eliminating the exposure of your google account address) and then a gear icon. Click on the gear icon and you’ll at least see Help, Account Settings, and Logout. So, for more help on Maps: Click on the gear icon and choose Map Help. If you have a specific question, you can type that into the search box. If you want to read the users’ guide, scroll down to the ‘Learn more about using Maps’ section. Published by MrsGeek, in Blog. Tagged with Google Maps, Panoramio, Street View.